“The connections between County Clare, Ireland and La Guajira, Colombia may not be entirely obvious at first glance. Yet the regions are linked through a shared commodity: coal. Extracted in one region and burned in the other. 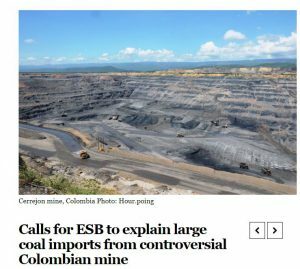 “The issue was also raised in the Dail by Sinn Fein Deputy Sean Crowe earlier this summer as he was “disturbed” about the large volumes of coal coming from Cerrejon. Speaking in July, Mr Crowe said that Glencore, one of the three multinational companies operating the mine, is currently under investigation in the US for “massive corruption and money laundering in its mining operations throughout the world”. “The news that power has been running over the last quarter without Moneypoint shows that we can afford to close the plant earlier than 2025 as currently scheduled, according to Green Party Leader Eamon Ryan. “Human rights groups are pushing for a public hearing on the coal purchase deal. The Department of Communications, Climate Action, and the Environment, as well as the Oireachtas committee with that brief, have asked the ESB for explanations. 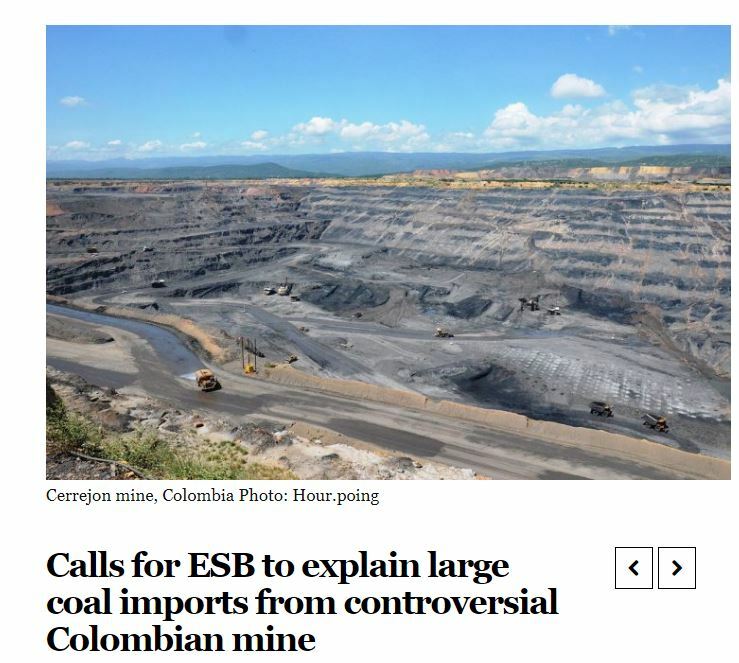 Over the past seven years, ESB has sourced some 7.5m tonnes of coal through CMC Coal Marketing, a Dublin-registered company set up to market and distribute coal from Cerrejon in Ireland and internationally. “Using coal from one of the world’s largest open-pit coal mines in northern Colombia cannot be justified by the ESB and other energy utilities, given its impact on human rights and contribution to climate change, according to a US academic. 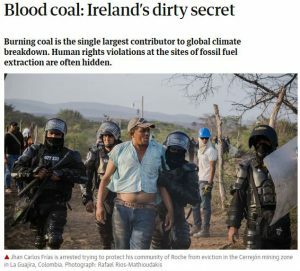 “Clodagh Daly of the Latin American Solidarity Centre said Ireland is hypocritical in contributing millions each year to the UN climate fund to support developing countries responding to climate change while continuing to import from the Cerrejon mine. “A lawsuit launched against the ESB’s coal supplier in Colombia heightens the urgency for the semi-state to divest from buying coal from the South American country, an Irish human rights group has said.